Greg Hodnett won his first 410 feature at the Knoxville Raceway since 1994, on Brandt Professional Agriculture Night #1 of the 58th Annual 5-hour ENERGY Knoxville Nationals presented by Casey’s General Stores. The Spring Grove, Pennsylvania native led all 25 laps of the main event, holding off Tim Shaffer at the line, and garnering $12,000. Kyle Larson, who finished third, was high point driver of the night, followed by Donny Schatz, who drove from 21st to fifth, and had to make his way to the main event through the B main. Hodnett led early over Brock Zearfoss, Shaffer, Lucas Wolfe and Gio Scelzi. Scelzi moved into fourth on lap two, while Larson entered the top five. Hodnett was getting into lapped traffic, when Jamie Ball could not avoid Clyde Knipp in turn four and turned over. He was uninjured. Shaffer snuck under Zearfoss to take over second on the restart, and Scelzi and Larson followed him into third and fourth shortly thereafter. Austin McCarl slowed with motor issues with 14 laps in the books, bringing out the yellow flag. Larson used the restart to get by Scelzi for third. With six laps to go, Dominic Scelzi’s top ten run ended when he stopped on the frontstretch. Hodnett took the field back to green ahead of Shaffer, Larson, Scelzi and Wolfe. Donny Schatz and Ian Madsen, who had to advance through the B main came from the back of the field, used restarts to surge through the field and salvage good point nights. In the end, Shaffer would make a late charge, but Hodnett was too strong in the Mike Heffner #27. Shaffer finished second, ahead of Larson, Gio Scelzi and Schatz. Ian Madsen (from 22nd), Lucas Wolfe, Aaron Reutzel, Kerry Madsen and Zearfoss rounded out the top ten. Logan Schuchart set quick time on the night, but failed to go to the scales after winning the B. Brady Bacon, Ball, Dominic Scelzi, Clyde Knipp and Zearfoss won heats. 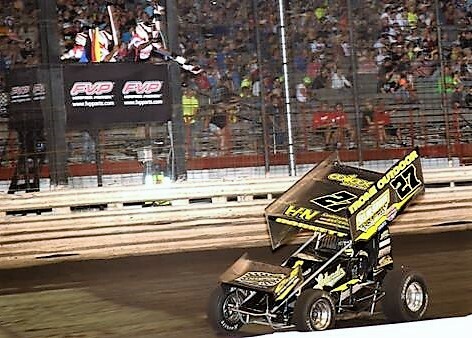 The 58th Annual 5-hour ENERGY Knoxville Nationals presented by Casey’s General Stores continues Thursday, August 9, and continues through Saturday, August 11. There are still tickets available for the biggest event in sprint car racing! For more information, visit www.KnoxvilleRaceway.com!